Japan is not the first place you think of when you bring up the sport of surfing. But in the little town of Hyuga, a southern port city in the Kyushu region, that’s exactly what you’ll find. Pristine beaches, popular surfing spots, no frills. It’s also where you would have found Jake Albertson teaching English in 2006. After graduating with a degree in Sociology from Brown University, Jake took some time before attending law school seeking simplicity in his life. While his surroundings in Hyuga were picture-perfect, Jake’s inability to communicate effectively in Japanese made his day-to-day experience exceedingly complex. Life in Japan forced Jake to change the way he thought about language and communication. He learned how to hone the all-important skill of keeping it simple. During his year in the Japan Exchange and Teaching (JET) program, Jake taught English to 9th & 10th graders, coached students preparing for English-speaking competitions, and eventually became conversant in Japanese – nothing fancy, just enough to get by. Jake also made a name for himself as the worst karate student his dojo had ever seen, a nightmare at the karaoke bar (tone-deaf and loud), and the only adult in town who biked with a helmet on. Jake has never forgotten the important lessons that Hyuga taught him about effective communication, and he continues to practice the art of simple today. Fortunately for all of us, his karaoke days are (mostly) behind him. 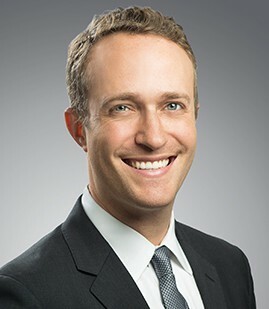 Jake Albertson focuses his practice on complex commercial disputes and intellectual property litigation. He has substantial experience representing record companies, artists, television service providers, real estate companies, and companies in the food and beverage industries. Jake has represented clients in all stages of litigation, including pre-litigation counseling, motion practice, and trial. Won summary judgment and defeated a motion to dismiss on behalf of a large winery in a significant shareholder litigation. Successfully represented a major record company in a long-standing dispute concerning a catalog of songs. Currently representing record companies, songwriters, and performers in ongoing copyright infringement litigation. Currently litigating on behalf of a restaurant and television industry client in actions concerning the ownership of several restaurants. Representing a television studio owner in litigation over complex real estate transactions relating to the Hudson Yards development. Representing a ballet studio owner in litigation concerning the lease of the studio. Advise music industry clients concerning intellectual property ownership issues. Provide pro bono counseling to a non-profit that offers free educational and college prep services to students in New York City. Represented a television service provider in multiple suits concerning intellectual property, contract disputes, and telemarketing law. Cases included a consumer class action and a suit by the U.S. Department of Justice and four state attorneys general. Represented a cosmetics packaging manufacturer in a patent licensing dispute. Drafted motion to dismiss that led to favorable settlement. Represented various financial services companies in state and federal court securities litigations across the country. Represented a Big Four accounting firm in investigations by the SEC and CFPB.